Peggy and Tim Walters: She took no pay; he boosted the dealership's used-car business. 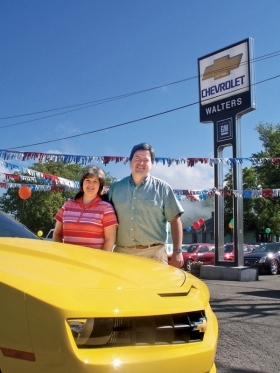 Store: Walters Chevrolet, Elkland, Pa.
At the beginning of 2009, Tim Walters, his father and two uncles each owned separate small-town dealerships named Walters Chevrolet. One remains: Walters Chevrolet in Elkland, Pa., a town of about 2,000 near the border with New York state. The store is owned by third-generation dealer Tim Walters. Walters Chevrolet in Camden, N.Y. -- started by Walters' grandfather and great-uncle in 1945 -- was closed by Walters' dad because it was doing poorly. Walters Chevrolet in Groton, N.Y., owned by an uncle, was rejected by General Motors when the automaker reorganized under bankruptcy last year. Walters Chevrolet in Gouverneur, N.Y., owned by another uncle, folded after it lost its finance contract with GMAC Financial Services. Tim Walters, 40, says that 2008 was an anomaly and that he was scared that the financial woes of GM or GMAC, his lender -- or both -- would take him down. He says he believes his fear of failure helped him survive the bleakest time in his life. "I showed up every day and did the best I could," Walters said. "If I failed here, it would have been over for me. I couldn't get my head around that." In 2008, new- and used-car sales stagnated. Used-vehicle prices plunged. Walters took advantage of the rock-bottom used-vehicle prices and passed the savings on to his customers. His used-vehicle sales rose from 349 vehicles in 2007 to 403 in 2008. But Walters' new-car sales were dismal, plunging in the fourth quarter of 2008 to 18 from about 60 in the fourth quarter of 2007. Reluctantly, Walters laid off four of his 14 employees: a title clerk/secretary, bookkeeper, mechanic and carwasher. His wife, Peggy, took the unpaid position of title clerk/secretary. A salesman with an accounting background divides his time between selling vehicles and bookkeeping. Through GM's bankruptcy and the poor economy, Walters hung on. New-car sales began to pick up in August 2009, jump-started by the federal government's cash-for-clunkers program. At the same time, used-vehicle prices skyrocketed. From July to November 2009, Walters bought no used cars at auction. Instead, he gave customers more money for their trade-ins, which boosted new-car sales and replenished his used-car inventory. In the fourth quarter of 2009, Walters sold 72 new vehicles. Business is still picking up. Walters hired another mechanic, put his wife on the payroll two months ago and took his family to Walt Disney World in April -- their first vacation in more than two years. Through it all, Walters says, he remained profitable. He says he is cautiously optimistic that the worst is behind him, but it still bothers him that dealerships owned by his family didn't make it. "I'm proud I made it through," he says, "but it's an empty victory because they didn't."